to provide the best sonic attributes of both, without their weaknesses. Allen Wright's excellent DPA 300B amplifiers with the MaxxHorn Immersions share the spotlight in a mini review by Roger S. Gordon, Positive Feedback, Issue 21. "The combination of the Vacuum State dpa300Bs with the MaxxHorns was a marriage made in heaven. All the problems that I had heard on my initial listen disappeared. With the dpa300Bs, the sound was coherent, detailed, dynamic. This was easily the best sound that I had heard at the show. After half an hour of listening I had to leave in order to meet some friends for dinner. I had just left the room and was saying good bye to Allen out in the hall where he had been conversing with one of the Rhino people when I suddenly heard Bela Fleck's Flight of the Cosmic Hippo coming from the room. I know and love this bass guitar piece and use it as my test track when demoing subwoofers. Back into the room I went. What I heard was the best sounding Cosmic Hippo I have ever heard and I have heard it on quite a few systems including my own." Thank you Allen Wright, Vacuum State Electronics for your very special efforts to bring your amplifiers to our room for a very special audition. The revolutionary dpa300B monoblock Power Amps are now in production! Available as both kits and fully finished products, the dpa300B brings a radically new topology and sound quality to the world of Tube Power Amps. 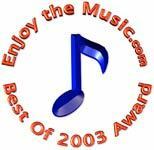 This amplifier was first shown publicly at the 2003 VSAC Convention (www.vsac2003.com) won an enjoythemusic.com Amplifier Product of the Year 2003 award in December 2003, and (as we understand) is in the running for the same award in 2004. 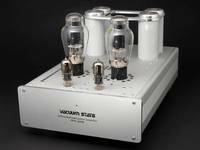 Read also Lynn Olson's VSAC Report (www.nutshellhifi.com/VSAC2003.htm) including the dpa300B. In previous announcements, several versions of this amplifier using KT88 output tubes were described, but over the intervening year these designs, while spectacular, were proven to be sonically inferior to the extreme qualities of the 300B based model, and as they would cost almost exactly the same to produce, have been quietly dropped from our production plans. This allowed us to optimise the circuit for 300B tubes, and further increase it’s sonic virtues. The dpa300B can use all 300B tubes from the classic Western Electric 300B (and it’s lower priced clones) right up to the monster ‘52 variants from the Prague consortium of Kron, Emission Labs and EAT. Classic 300B’s produce 18 watts of output power, the biggest tubes easily make 25 watts. Unless otherwise client specified, dpa300B’s are built to use the classic 300B tube, but to gain the extra power available from the bigger tubes all one needs to do is change the value of one resistor per monoblock. This is easily done by your dealer, or by yourself if reasonably competent with a soldering iron. Extensive listening has proven that these amps are not restricted to working their sonic magic with just one type of speaker. Cones in box types–full range or complex multi way, planars–electrostatic or magnetic, and horns–large or small, all sing beautifully on all music types. While they may not be the first choice for electronic music, they are superb on all other forms; solo performer, small ensemble or full orchestra; vocal or instrumental; multi-tracked studio recorded or acoustic live performance. Classic, jazz, rock, country, new age—you name it, the dpa300B brings astonishing you are there life to them all! We have also been working very hard to organise the component supply lines, optimise the production methods and train assembly technicians. To this end a pre-production batch of kits and finished amps have been built and (Dec 2004) are in the process of being shipped to the keen early adapters who ignored our previous requests to wait for further announcements, and demanded to be supplied anyway. All finished dpa300B’s are 100% hand built, and from Jan 2005 this will be done in our new & much larger facility near Schaffhausen in Switzerland. Hence even with the expected demand we are confident that we can provide even better quality and consistency than when they were being built one by one. The kits are supplied with exactly the same premium quality components used in the finished units—and as long as you have reasonably competent electronic construction skills or have a good friend who does, and are willing to follow the thorough instructions, your kit dpa300B will be optically and sonically identical to the factory units. We are very excited about this amplifier, believing it is a major step forward in tube power amp design, and know it will bring exceptional musical qualities to those who are searching to recreate the excitement and realism of real music of all types in their homes, no matter what associated components are involved.